The objective of this study is to contribute to knowledge on the intensive rearing of the grasscutter (Thryonomis swinderianus), which is cherished for its meat and as a source of protein. The study, which involves five treatments and four replicates in a Completely Randomized Design, aims at determining the optimum performance of growing grasscutters fed diets in which soybean meal is replaced by brewers dried grain. Twenty female grasscutters, four weeks old, and weighing between 1312g and 1315 g, were randomly allotted in groups of four to five treatment diets, in which soybean meal was replaced at 0, 25, 50, 75, and 100% levels by brewers dried grain. The grasscutters were supplied water and elephant grass (Pennisetum purpureum) ad libitum. All data was subjected to the analysis of variance, and significantly different means were separated using Duncan's Multiple Range Test. Results indicate significantly (P=.05) superior performance in respect of average daily forage intake (278.70g), average daily total feed intake (75.54g), final body weight (2145.30g), average daily weight gain (9.79g), feed conversion ratio (7.73) and cost to gain ratio (0.34) for grasscutters in the 50% diet group. It was concluded that the best growth performance was obtained when grasscutters were fed a diet in which 50% of soybean meal was replaced by 50% of brewers dried grain. Grasscutters growth diet brewers dried grain soybean meal. Author G.S.I.Wogar designed the study, wrote the protocol and the first draft of the manuscript. Author M. I. Anya supervised the conduct of the experiment. Author P. Benson, undergraduate student, carried out the hands-on experimental work. The three authors managed the analyses and statistical analysis of the study. The three authors read and approved the final manuscript. 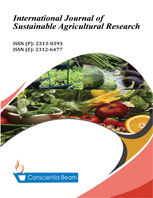 ( 55 ) Farmer’s Decision To Practice Crop Rotation in Arsi Negelle, Ethiopia: What are the Determinants?